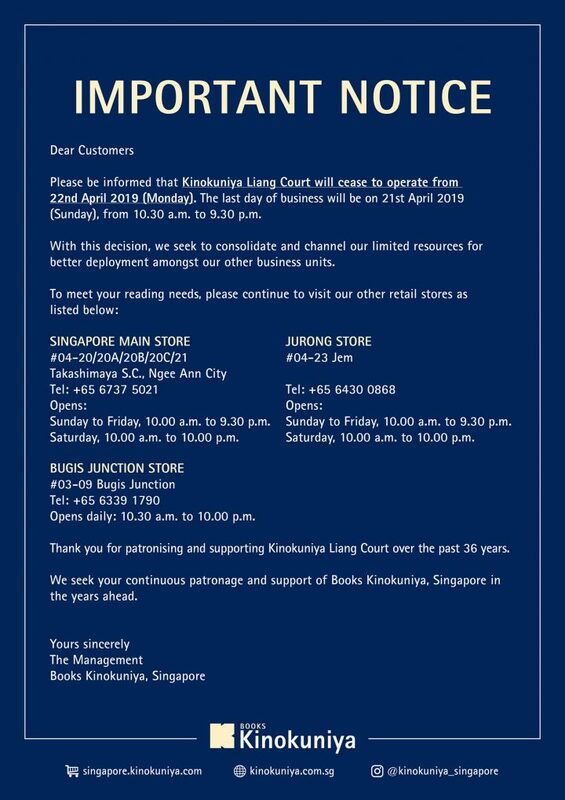 A sad day for fellow otakus and book nerds: Books Kinokuniya at Liang Court is closing down. The last day of operation for the branch will be on April 21, 10:30 am to 9:30 pm. The reason for the closure is that Kinokuniya is seeking to consolidate the bookstore chain’s limited resources to be better deployed to their other retail stores, which will still be in operation. Books Kinokuniya at Liang Court first opened their doors to the public in December 1983. It was also the first Kinokuniya outlet in Singapore; this year would have marked the branch’s 36th anniversary since their opening. While it was initially seen as a bookstore catering to the needs of the Japanese expat community, it has since diversified into a haven for book lovers of all kinds. The bookstore chain went on to open three other outlets: the main store at Takashimaya Shopping Centre, and two other stores at Bugis Junction and JEM. Despite being smaller than the main store, it is a popular haunt for otakus and connoisseurs of Japanese pop-culture, given its wide range of Japanese books, comics, magazines, novels and light novels. It also has a bargain alley where a selection of books and magazines are sold for relatively cheaper prices. Unlike the other outlets located at prominent shopping spots, the Liang Court branch is also notably popular for the relatively serene and peaceful shopping experience. As the mall is also frequented by Japanese customers, the bookstore broadcasts Japanese announcements alongside with the usual English and Mandarin Chinese ones. It’s sayonara for now, though the memories will remain.